At Giant Inflatables, no product makes it through production before seeing many different people and teams; design, safety, functionality and more are all addressed at different stages of production. David Abramowitch, the director of Giant Inflatables, is your first contact when doing business with us. As a design professional and creative thinker, educated in architecture and aided by almost 2 decades of industry experience, David is the one who helps you realise your inflatable dream. Once you’ve seen David with your enquiry, it is his job to tell you whether giant inflatables can provide the ideal solution. If the enquiry proceeds, the design process must now begin to ensure that a design gets back to you as soon as possible. This is where the “genius Team” comes into the picture. The genius team and the director himself sit down and discuss the best way to create the perfect inflatable for the client. Planning is key, and the more information they receive from the client about their vision of the inflatable, the more precise they can be when designing it (To see what information is crucial when describing what you want from your inflatable, see our other blogs). Once the plans are set, the genius team use advanced 3D design software to create a visual representation of the product. The genius team will also decide the best places for the signage (if required) on the inflatable. Each design is extremely precise and contains all the information that is needed pass the product onto the manufacturing team. The engineering team: this is the team that ensures the inflatable remains a top quality product, using the best materials and making safety the number one priority. The design team will create the visual representation of the inflatable, but it’s the manufacturing team that will ensure that he product will stand up to the giant inflatables standard. With trained engineers on the team, they will decide the best materials to use to ensure safety, build quality and print quality. They also ensure that the design is ready to be turned into a physical product. The Inflatable has been now through David’s initial enquiry process, has been turned into a visual representation, and been worked on by the manufacturing team, the design is then sent back to the client with, an estimate of manufacturing time, for approval. Now it’s building time. The design goes back to manufacturing and passed onto the building team. The building team are the ones with their hands on, the ones physically sewing, cutting, printing, folding and packaging the inflatable. The build team transform rolls of material into a working inflatable product with the utmost precision. The build team are trusted by us to ensure the Giant Inflatables quality of production is met. A rigorous and detailed production schedule is constructed so that quality is not lost due to production time deadlines. Thanks to a brilliant building and manufacturing team, you can expect a top quality inflatable when you need it, a Giant Inflatables guarantee. The whole process is overseen by the care team, who are there to ensure you, the client, is constantly updated and happy with the product. However, their job doesn’t end when the product is delivered. The care team are available to demonstrate the inflatable for you, prior to your event, or to help you transport and set up the inflatable for you if required. The care team will be in contact with the client, making sure the inflatable is exceeding expectations and the client is happy with their product. Giant Inflatables is more complex than its competitors, providing the client with the greatest in quality, safety and guaranteed delivery times. Given the complexity, Giant inflatables can be trusted to deliver on promises. If it is new and experiential and interactive and sports related and inflatable you can be sure the Giant Inflatables “Genius Team” are busy with it. AFL 2017 - Giant Inflatables Season in Review. As official supplier for AFL Victoria, Giant Inflatables has developed a special relationship with the sport, and its organising body. Through years of work and play, Giant Inflatables has developed dozens of sports inflatables for the AFL and its affiliated teams. This season, Giant Inflatables created many units for the AFL and affiliated teams. Many of our inflatables are taken across Australia to help increase and diversify the AFL fan-base. 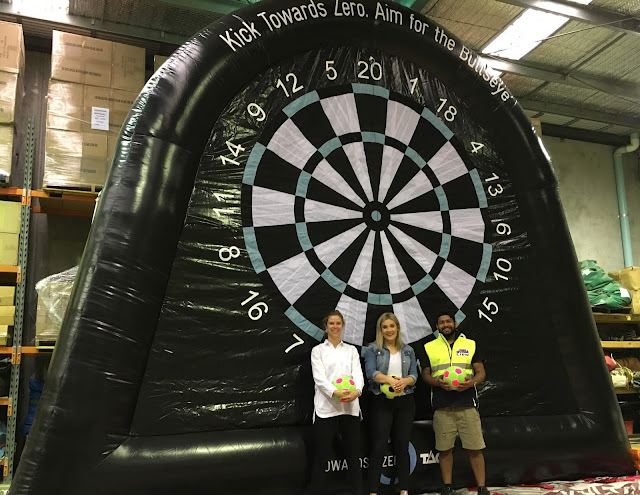 This year's AFL country inflatables included, Inflatable Stadiums, Mini Goals, Handball Targets, Climb And Slide, and many more. With our units travelling the country, we also supply inflatables for more local uses. 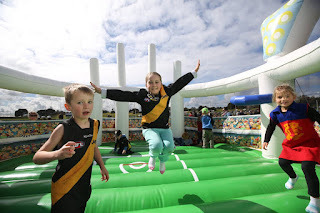 2017 Premiers, Richmond Tigers, received a Giant Inflatable Club Jersey which was proudly displayed at all their game day events. Giant inflatables also contributed to this years Kick Across the Yarra with inflatables buoys and even a Giant KFC bucket into which players would kick the ball. Over two decades of industry experience, Giant Inflatables has become the leader in inflatable activations, specializing in sporting inflatables. 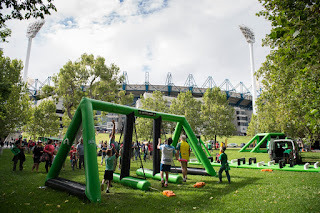 Inflatable playgrounds, or popup playgrounds, like those supplied to AFL Victoria, Melbourne Stars, and 2016 AFL Premiers the Western Bulldogs (to name just a few), are perfect for fan engagement and brand activations. Sharpening game based skills like hand eye coordination and agility whilst still offering a fun and engaging activity. 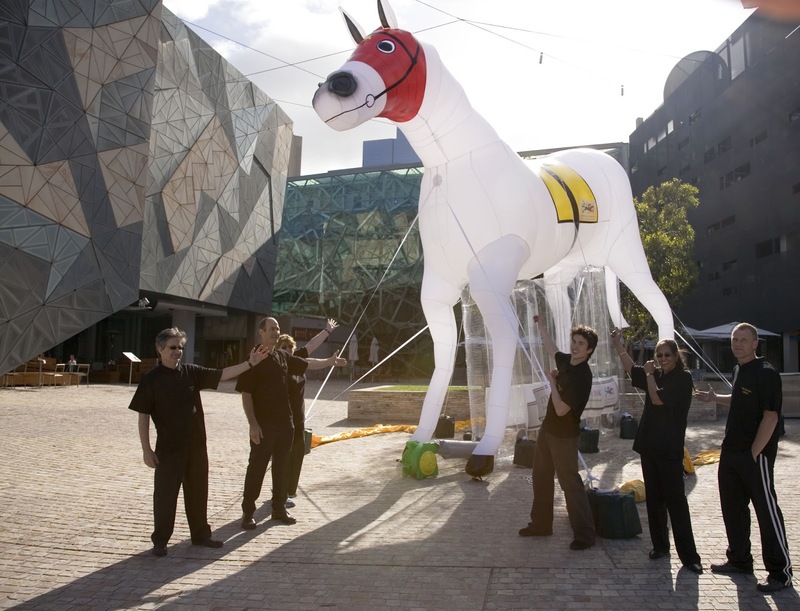 Established in July 1998, Giant Inflatables has focused on producing attention-grabbing inflatable advertising. This covers such products as Interactive Inflatables for Sports Marketing, Ravers, Inflatable Arches, Adflatables, Inflatable replica products,Inflatable Rooftop Balloons, Point-Of-Sale and Mini-Inflatables, Custom Inflatables and a wide range of Industrial Application Inflatables. We find both the conception and creation of such inflatable advertising media extremely exciting. We hope our blog will keep you up-to-date on our latest inflatable projects, evolving technologies and exciting ideas.